Bishop Hanson presents His Beatitude Michel Sabbah, Latin Catholic Patriarch in Jerusalem, a commemorative medallion displaying the ELCA emblem. 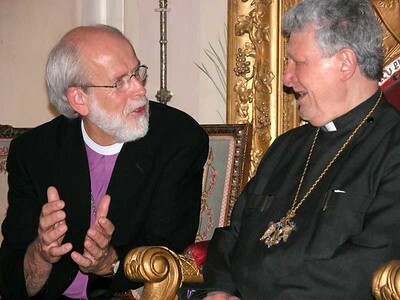 His Beatitude Ireneus I, Greek Orthodox Patriarch of Jerusalem (right), spoke with the ELCA delegation as H.E. 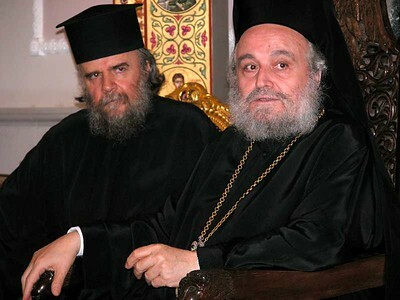 Metropolitan Aristarchos translated. 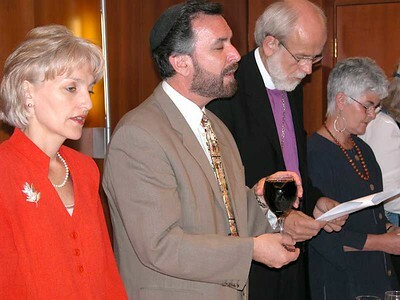 Rabbi David Rosen, international director of interreligious relations for the American Jewish Committee, led the ELCA delegation in song and prayer during a Shabbat Shalom dinner on May 23, 2003, in Jerusalem. 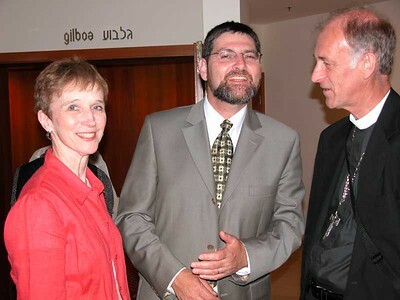 Sharon Rosen (left) and Rabbi Rosen hosted the dinner for the Rev. Mark S. Hanson, Presiding Bishop of the Evangelical Lutheran Church in America, his wife, Ione, and the ELCA delegation. 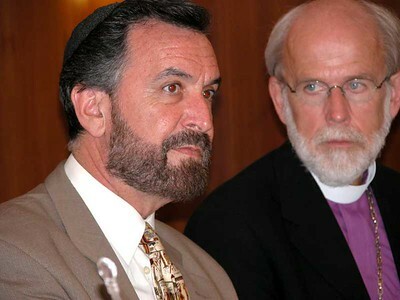 The Rabbi David Rosen, international director of interreligious relations for the American Jewish Committee, and ELCA Presiding Bishop Mark S. Hanson shared Shabbat Dinner on May 23, 2003, in Jerusalem. 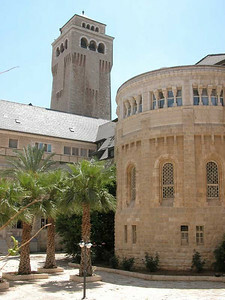 May 23, 2003, was an important day for Shatha Abu Srour, a 12th grade female blind student who graduated with honors from Talitha Kumi School located in the West Bank town of Beit Jala. Born blind, Shatha acquired her primary education at the Helen Keller Center for the visually impaired in Jerusalem and later was mainstreamed in Talitha Kumi School in her hometown. The Lutheran schools are among the first pioneers in advocating and promoting Education for All and Inclusive Education. Shatha will be studying psychology either in the USA or at Bir Zeit University after graduation. Congratulations! 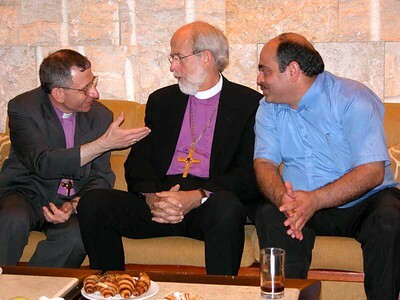 Rabbi Ehud Bandel, President of the Masorti Movement in Israel, shares a story with Bishop Floyd and Betty Schoenals after a gathering in Jerusalem. Rev. 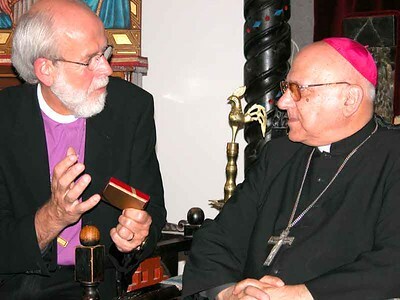 Schoenals is the bishop of the ELCA Arkansas-Oklahoma Synod. 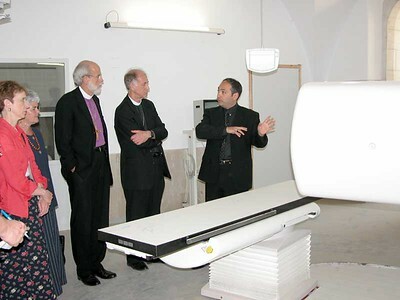 Dr. Tawfiq Nasser, Chief Executive Officer of Augusta Victoria Hospital, provided an overview of the services of Augusta Victoria Hospital to Betty Schoenhals, Ione Hanson, ELCA Presiding Bishop Mark Hanson, and Rev. Floyd Schoenhals, Bishop of the Arkansas-Oklahoma Synod of the ELCA. 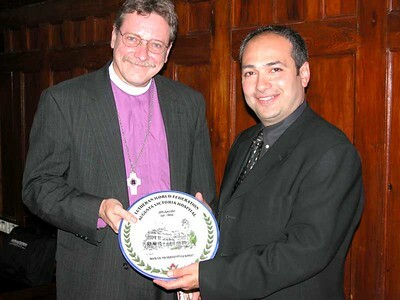 Dr. Tawfiq Nasser, Chief Executive Officer of Augusta Victoria Hospital, presented a commemorative plate to Rev. Stephen Bouman, Bishop of the Metropolitan New York Synod of the ELCA.